The Register reports Intel accidentally revealed the specifications of its "Poulson" Itanium processors, you can check it out over here. Known as the Itanium 9500 series, Poulson is anticipated to be launched sometime this year, probably at the Intel Developer Forum in San Francisco in early September. 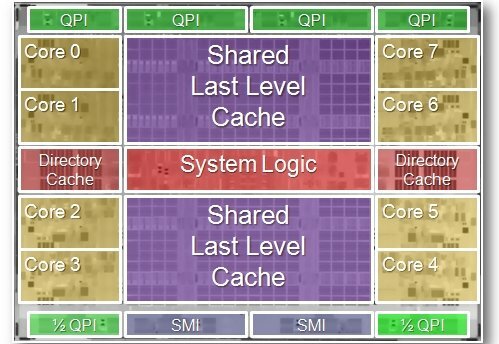 Poulson has eight cores, two directory caches, five QuickPath Interconnect (QPI) links, two Scalable Memory Interconnect (SMI) DDR3 memory controllers that support up to 512GB per socket, two shared L2 caches, and a bunch of system logic all on the same piece of silicon, which has a combined 3.1 billion transistors packed into a 588 square millimeter die size. The top bin part is expected to throw off 170 watts, which is a bit better than the 185 watts of the top-bin four-core Itanium 9300 processor it will replace. As you can see, the Poulson uses a "cores out" design, just like the current "Sandy Bridge" Xeon E5s, and similarly has a ring interconnect that lashes together the cores, caches, and other elements of the processor.